Summary : This tea is a green rooibos tea that has been infused with a motley of ingredients, and ends up producing a beautiful light-orange tea that even tastes a bit like oranges, too. A refreshing tea, in the end. Review : So...here it is. Late November. My most hated time of the year. The sun sets early...and will only set earlier. The weather turns colder...and will only turn colder. And the first storms of the season sweep in over the Sierras, making for windy and less than perfect conditions here in Reno, Nevada. And so with these depressing thoughts swirling through my mind, I rummaged through my growing tea collection for something to lift my spirits. So what did I find? A neglected rooibos tea from Culinary Teas that had the name "summer" in the name! Yes! Just what I needed. A walk down memory lane through the beautiful summers we have in Northwest Nevada. Days of endless sunshine, of warm days and cool nights. In short...a summer tea was just what the doctor ordered to lift my spirits on this cold and windy November night. The tea is called Summer Punch Green Rooibos and is put out by Culinary Teas. So, what is all in this tea? Well, it contains quite the list of "summer" ingredients. Here is what Culinary Teas says about this tea: "Summer Punch Green Rooibos is flavored with strawberry, peach, orange, sunflower blossoms and cornflowers. A refreshing herbal tea!" OK. Let's back up here. This is a rooibos tea that has been infused with various herbal ingredients. So I guess you could say its a herbal tea in some ways, but the tea leaves themselves are all rooibos. However, this is a green rooibos tea, not a traditional red rooibos tea - hence the green color of the leaves. So, what does that mean? It means that the fermentation process of the tea leaves, which is traditionally quite long for standard red rooibos, is "cut short." This is accomplished by steaming the tea leaves soon after the leaves are harvested. And since the leaves are not given a chance for fully oxidize and ferment, the color of the leaves ends up green, instead of red. Simple, huh? 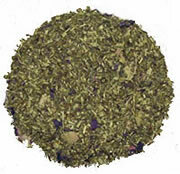 Additionally, like other rooibos teas, green roobios teas are caffeine free too. Well, enough of the education stuff. You can visit the Rooibos Tea Type section for more information if you want. Let's press on with this tea review. The fragrance of this tea, right after opening it up from the space-age wrapper that Culinary Teas packages their samplers in smelled wonderful. Oh, nothing to knock you down or anything...it just smelled "summerlike", for lack of a better word. And of course, as I wanted to be swept back to the summer, this was exactly what I wanted. This tea, once brewed, has an absolutely beautiful color. During the brewing process the tea develops a beautiful, light-orange color. So be sure to drink and brew it in a clear cup. As for the taste, I was pleased with it. Since I really had no idea what to expect taste-wise from this tea, I wasn't too shocked when it didn't taste like a "summer punch." A bit disappointed, perhaps - but not shocked. Still, the tea had a nice, light flavor to it. I had no complaints. Trying to describe this flavor, though, is hopeless. Other than a light and weak orange taste, there was nothing in this tea that leapt out at me. Still, the taste of the tea was good. And, most importantly, drinking this tea did indeed make me forget, for at least a few minutes, that the winds of November were sweeping in, heralding a long and dark winter ahead. Recommendation : Yes. The tea has a light taste of orange to it, along with some other tastes I couldn't quite identify. Yet, it was a tasty tea. I had no complaints.